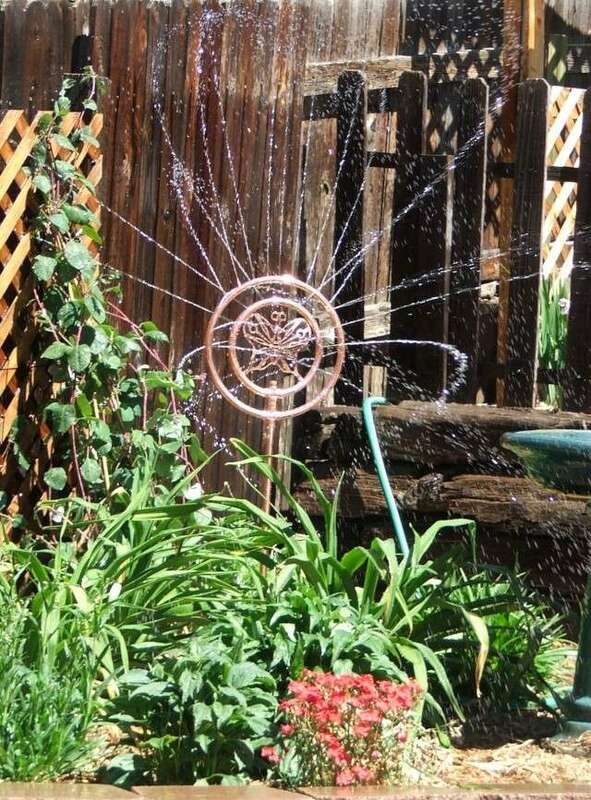 Jean (my wife) got a new sprinkler for her butterfly garden. I though you might get a kick out of it. The inner and outer rings rotate in opposite directions and throw up curving sprays of water, really quite pretty. Love the timing on #2 where the water swirls are very evident. I have no idea...tried using both Safari and Firefox, and no photos what so ever... I have to use Firefox to type any messages here, cause for what ever reason, when I use safari, i have a white screen and a white text, so no can see the letters.... Sharon knows what I mean, cause I had this problem once before, but got it fixed, but now it won't fix. OMG..... The photos are NOW there... This is too freaky!!!! wonderful shots Griz, i love gadets like this for the garden, but we can't seem to keep them here, always some little thieves about!! Thanks for thinking of me Griz, lol a sprinkler of any kind would be lovely, we have to carry buckets of water. I would love one of those in the garden, just to sit and watch it.